Comfort, ease, style, and quality in one package. “Too good to be true,” you say? Get ready to eat your words after trying on this TAG Heuer Men’s Link Stainless Steel Automatic Day/Date Watch WJF2010.BA0592. If you’re a man who won’t settle for less than excellence, and you believe you shouldn’t have to, TAG Heuer will back your conviction with this multi-faceted timepiece. The Link men’s collection bills itself as sporty but elegant, unique but classic. The ergonomic design of the bracelet ensures maximum comfort but also pleases the eye with flowing “S” links of fine-brushed steel. Silver, luminescent hands navigate the face of the watch without the help of a battery. Powered by your own arm’s movement, this watch keeps track of time, but also date and day inside innovative display windows at 12 and at 6 o’clock. 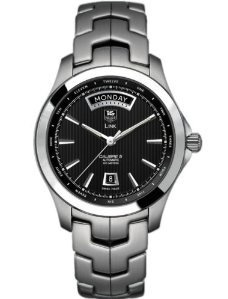 Subtle, vertical lines texture the dial, while spelled-out hour names follow the gentle curve of the polished bezel. With a power reserve of 38 hours, this timepiece won’t require winding if you give it a day off. Your quickest glance returns the day, date, and hour . . . and even by night, this watch’s glowing hands and indexes ground you in time. With a frequency of 28,800 vibrations per hour, the second hand glides continuously through its rotation. Add the Calibre 5 automatic movement to this piece’s water resistance and the TAG Heuer seal, and you’re not likely to bid it adieu, whatever your attire. If you’re looking for a dressier watch with a similar design, the Link collection offers this piece in a two-toned design, with 18 kt gold accenting the bracelet, bezel, and dial. The Link line also features chronographs in exchange for dial space. Some of Link chronograph models manage to squeeze in the day and date, but the effect is more cluttered. For added, but affordable sports functionality, the battery-powered Aquaracer features turning bezels and high water resistance. If you’re a fan of the automatic watch but want added utility within a fashionable strap, the Grand Carrera collection offers any array of luxury bands (alligator) with stylish dials and gold accents that will dress any wrist. In the Grand Carrera collection, however, the price tag increases between $500 and $4,000. Considering the refinement, comfort, and practicality of the TAG Heuer Men’s Link Stainless Steel Automatic Day/Date Watch WJF2010.BA0592, at $2,800, you won’t be settling for second best. The TAG Heuer legacy marks this timepiece, front and back, with quality. With its unique styling and pragmatic features, this watch blends timekeeping with artistry for a sensible price (a price that online retailers list as low as $1,790). While TAG Heuer doesn’t complicate the piece by cramming in every possible feature, the Link Stainless Steel Automatic Day/Date Watch WJF2010.BA0592 stands ready to please even the most finicky time aficionado. we are travelling overseas on the 18th from Brisbane to Phucket. How much should i expect to pay duty free for a Tag Link day date.